When Vans released their latest line of trainers I don’t think they expected Scotland to go mad for them. The ‘Anaheim Old Skool Trainers In Og Blue And Gold’ are rather eye-catching and funky selling out in many sizes on ASOS despite costing a hefty £60. One of the reasons they are flying off the shelves though is because as some eagle-eyed shoppers notice the trainers bear similarities to cans of Irn-Bru, Scotland’s national non-alcoholic drink. 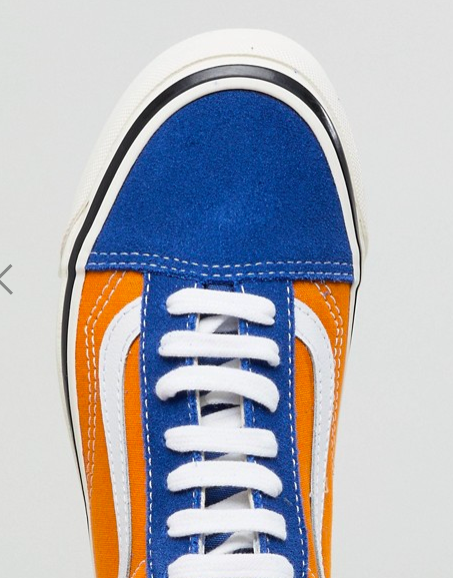 To be fair the colour scheme of the shoes is exactly the same one Irn-Bru has – bright orange, blue and white. And so it is no wonder then the trainers have been nicknamed ‘Irn-Shu’ on social media cheering up everyone’s day. Many people like Jack Aitchison are desperate to buy a pair because of the resemblance. The temptation to buy the Irn Shu is real. 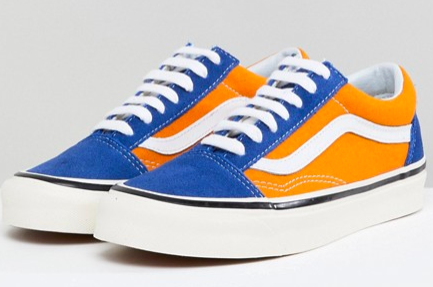 These Vans look like cans of Irn Bru and I don’t know if that’s a good thing or a bad thing. Imagine paying £60 to look like you’re wearing cans of Irn-Bru. To be honest though mate I and many others would happily pay up. The release of these trainers is much needed good news for Scots everywhere as earlier this year Irn-Bru announced they had stopped production of their original recipe. Back in January makers of Irn-Bru, A.G. Barr, confirmed the full sugar version of the popular fizzy drink would no longer be made. Instead they will follow a brand new recipe which is said to contain sweeteners which just isn’t the same! We know a lot of people are concerned right now about the changes to Irn-Bru. We understand. But we want to reassure you of a few things. Irn-Bru will still be made with the same secret flavour essence as it’s always been. So it’ll still have its unique taste. This isn’t changing and it never will. Irn-Bru will still be a sugary drink. We’re reducing the sugar, not losing it altogether. There will still be about four teaspoons of sugar in a can. We’ve done a shed-load of taste tests on this. In these tests, nine out of 10 people said we’ve got an excellent or a good taste match. We know we won’t convince everyone right now. But when you try it, we hope you’ll agree it still tastes amazing. This change was introduced due to the UK government’s impending soft drinks levy which came into action in April. The amount of sugar per can in the new brew has been slashed dramatically from 8.5 teaspoons to four, with the calorie count dropping from 140 to around 65. If you are still upset about the news though, maybe a pair of Irn-Shu Vans are exactly what you need to cheer you up.